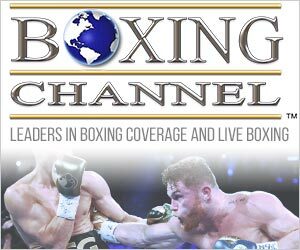 Houston, TX — Undefeated WBO junior middleweight champion Jaime Munguia found himself in the pit of hell against previously unknown Japanese pressure cooker Takeshi Inoue on Saturday night at the Toyota Center in Houston. Inoue forced Munguia to dig deep over the course of 12 grueling rounds, which saw both fighters swing for the fences for all three minutes of just about every round. At the end of a hard-fought battle, Munguia (32-0, 26 KOs) survived his third, and most difficult, title defense, winning the action-packed fight by scores of 120-108, 120-108 and 119-109. While the scores might seem too wide to some observers, it’s important to note that not all close fights are scored that way in boxing. Munguia began his professional prizefighting career at the tender age of 16 in Tijuana, Mexico. Almost six years later, averaging a grueling schedule of five fights a year, primarily within the confines of the city limits in which he was born, Munguia entered the ring having essentially punched his way out of Tijuanan obscurity into the new global sports streaming space pioneered by sudden industry leader DAZN. Inoue (13-1-1, 7 KOs) didn’t care about any of that. All the 29-year-old stocky puncher seemed concerned with heading into the biggest fight of his prizefighting life was shocking the world. 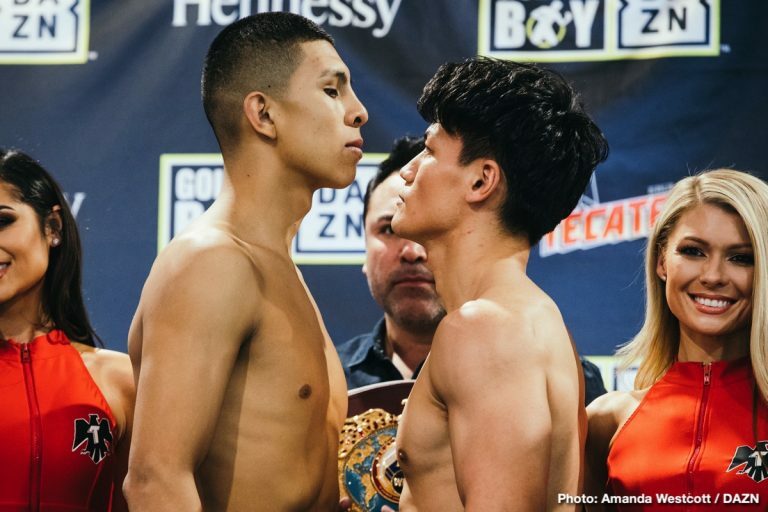 Having seen Munguia’s monstrous frame tower over his comparatively diminutive opponent during prefight festivities, when the two met in the center of the ring, it looked a lot like what one might expect when seeing a parent pick up a child after school. Except that when the bell rang here, it wasn’t going to be an audio cue for the kids to pack up their books and saunter toward the exits. Instead, the bell’s ominous toll meant it was time for Munguia to wreck Inoue with what might as well be G-O-D-Z-I-L-L-A emblazoned across his trunks. Come to think of it, this fight seemed at the outset to be the shortest, most unnecessary portion of the Godzilla movie franchise yet. Bring forth the army! Call forth the National Guard! Nah, nevermind. Just bring in this lonely little man in the center of the ring far from home with nowhere to run. Except that Inoue did run, and it was right into the action. 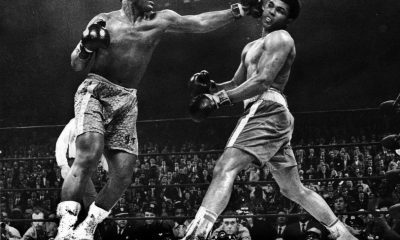 He was a brave, defiant challenger leaving everything he had of himself inside the ring during every round. 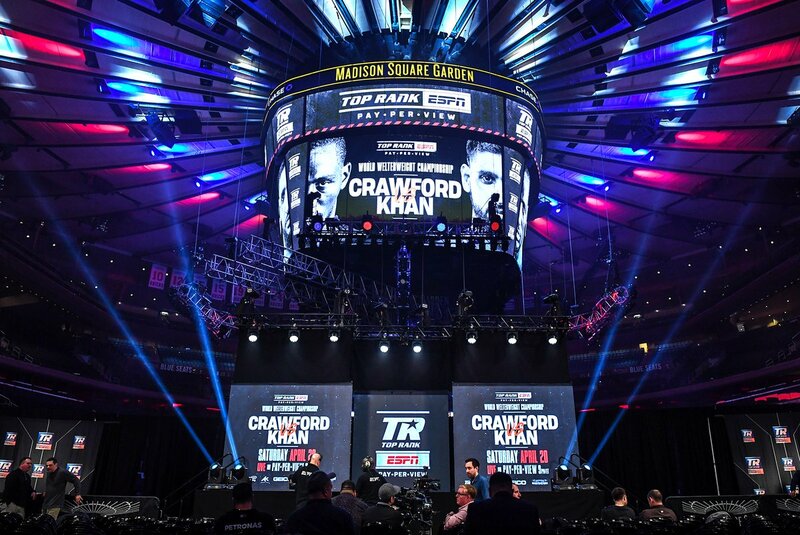 Overall, the fight boiled down to what happened during the first round repeating itself over and over again. Munguia was content to box from a distance, throwing hard jabs, deep left hooks and sizzling straight right hands all over his would-be usurper’s head and body. But Inoue was undeterred. He lunged forward like an angry bear, landing hard punches coming from wide, looping angles whenever he could get close enough to Munguia to land them, which had to be way more often than Munguia had hoped. Munguia took the best of Inoue when he could stay off the ropes and out of the corner, but Inoue seemed to get him in one or both of those places for at least some portion of every round. Both landed hellacious shots. At times, they took turns snapping each other’s head back, only to realize when their heads came back down that both them and their opponent was somehow still standing right there. The fight was simply this: hard punch, defiant smirk, rinse and repeat. Over and over and over again, Munguia boxed with precision, power and class. Over and over and over again, Inoue kept charging forward. Munguia came very close to getting the defining moment he probably wanted when he countered Inoue almost into oblivion. But almost is never good enough in a fight like this, and Inoue withstood the storm with just seconds left in the round. Both men fought bravely. If the wideness of the scores bothers Inoue, it shouldn’t. That’s just how math sometimes works in fights where one fighter just happens to edge out most all of the rounds by a hair. Inoue fought excellently and should be commended for the amazing performance, as should Munguia who had clearly just been in the fight of his life. If you think about it, Munguia was the anti-Inoue of 2018. 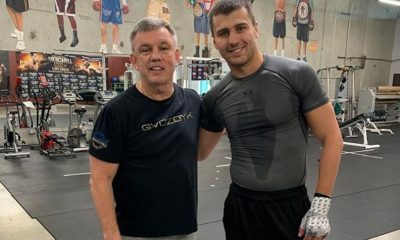 Like Inoue, the Mexican was also an unknown when he was presented to the Nevada State Athletic Commission as a possible opponent for Gennady Golovkin in May. But unlike Inoue, fate kept Munguia out of harm’s way when the NSAC wouldn’t authorize him as a credible opponent. Or maybe it was just Nevada. Because in retrospect Inoue’s resume looks way worse than Munguia’s did. How was this fight approved while the other one wasn’t? Would Nevada have sanctioned this one? Most anyone who witnessed what happened in Houston was probably glad they didn’t have the say. Perhaps the most amazing thing is that Inoue, who incidentally isn’t related at all to bantamweight superstar Naoya Inoue, had no credible wins–at least at the world level–on his resume before bravely storming across the Pacific Ocean to make his American boxing debut. The fact that Inoue was able to compete for Munguia’s world title at all is an example of how politics almost always trumps perceived fair play in the grand, ole sport of professional boxing, and sometimes that might not be a bad thing. Because Inoue didn’t look like a worthy challenger. He didn’t win his first fight, a six-round draw against Daishi Nagata in 2014 and hadn’t fought outside his home country of Japan except once. Inoue’s last three wins didn’t look great on paper either. He had notched victories over two single-digit win fighters, Niwat Kongkan and Iku Nagahama, and a 41-year-old Yuki Nonaka. His rise had been fast and furious in a way that bookmakers tabbed him a -5000 favorite against Inoue. 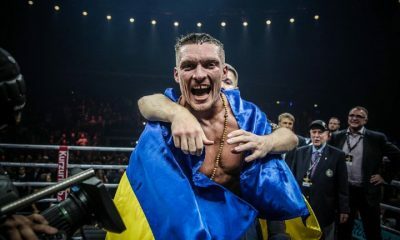 A 22-year-old world champion going from zero to hero in less than a year, title belt in tow with a lucrative opportunity to help usher in this new global boxing streaming age was surely going to wreck this no-hope fighter from all the way around the world. But that’s not what happened. Munguia, perhaps destined to become boxing’s next big thing, and Inoue, a fighter some considered just a Japanese club fighter flown in specifically so he could be butchered for the sake of some predetermined, 10-second-or-less, Mungia-hyping video assets, fought an excellent fight that no one saw coming. Nobody expected featherweight Xu Can to defeat Jesus Rojas in the co-main event of Munguia-Inoue, but Xu used relentless combinations and old-fashioned stick-to-itiveness to secure his first world title honor. Rojas, 32, had the odd displeasure of defending his secondary WBA featherweight world title right after losing his last fight, a 12-round unanimous decision to Joseph Diaz in August 2018. But Diaz missed weight for the fight, so despite grabbing the win, he didn’t walk away with Rojas’ title. 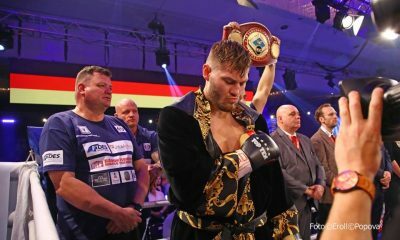 So Rojas made good on the opportunity created by the WBA rule, which allowed him to stay champion despite the loss, and Can, 24, made good on the wishes of a surprisingly strong and vocal contingent of Chinese fans to produce some stylistically scintillating action on the way to the upset victory. Rojas is an aggressive, come-forward fighter who only moves back at times to catch his breath. Can is more of a boxer, but really lets his hands go both inside and out. 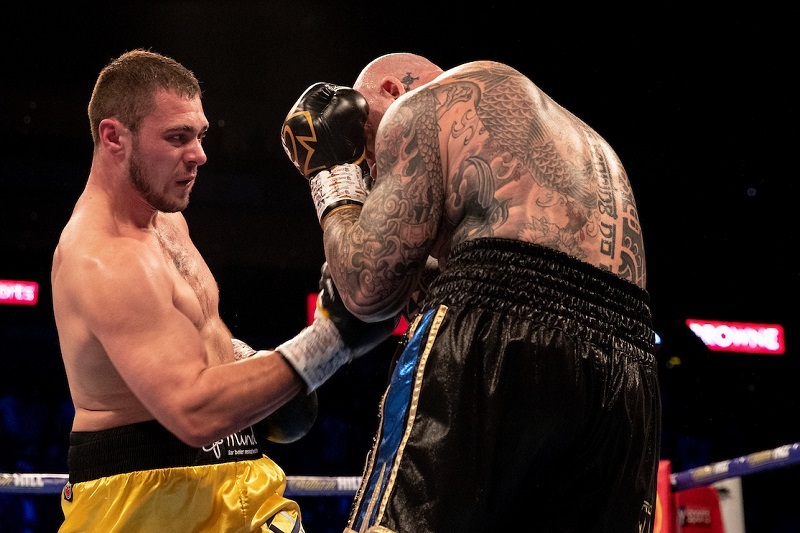 The result was some true featherweight fireworks in a fight DAZN’s Chris Mannix called an early Fight of the Year candidate for 2019. Both fighters fought to win, but neither possessed enough power really to hurt the other significantly. The judges favored Can (16-2, 2 KOs) because of his harder thrown punches and the way he kept the pedal to the metal when Rojas (26-3-3, 19 KOs) would tire. Judges scored the fight 118-110, 117-111 and 116-112 for Can. Junior welterweight prospect Vergil Ortiz Jr. defeated Jesus Valdez by fifth-round knockout running his impressive stoppage streak to 12 KOs in 12 fights. 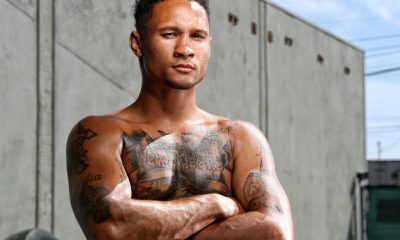 Ortiz (12-0, 12 KOS) might only be 20 years old, but he fights with an aggressive sort of patience befitting an older, more experienced fighter. The Dallas native sure looks like he’s on his way to a bright future. 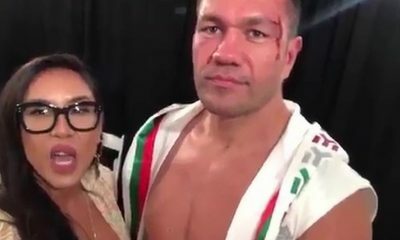 Ortiz wore Valdez (23-5-1, 12 KOs) down, battered him into a bloody mess and secured the stoppage win when the referee had seen enough of Valdez’s blood hit the canvas. 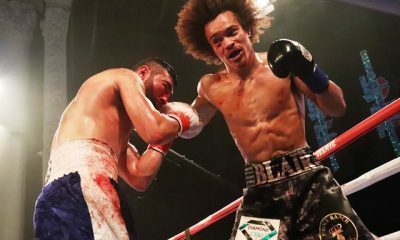 Ortiz is a hard puncher, but more impressive is the gumption with which he instigates the action and his ability to counter his opponent’s combinations. Those are the kinds of things that bode well for the prospect’s future. Before the fight, Ortiz said he intends to challenge for a world title by the end of 2019. He’s probably not quite ready for that, but he could be with a few more of the right kinds of fights in the near future. Junior featherweight prospect Alberto Melian (4-0, 2 KOs) stopped Mexico’s Edgar Ortega (10-2-2, 5 KOs) in the 10th round to remain unbeaten. The fight started rough for the Argentinian, but Melian’s Olympic pedigree came through as the fight progressed to the later rounds. 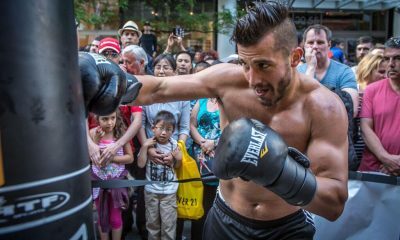 Dallas-based junior middleweight prospect Alex Rincon, 23, beat a very game, Jeremy Ramos in a six rounder. 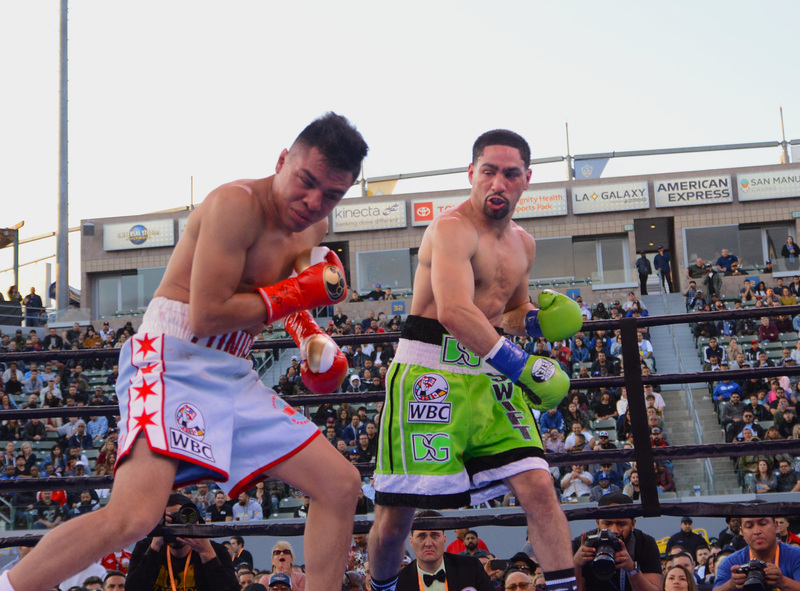 Rincon (6-0, 5Os) had to work hard but stayed unbeaten by steadily outworking Ramos (10-6, 4 KOs). His older brother, George Rincon (6-0, 3 KOs), knocked out Emmanuel Valadez (5-7, 4 KOs) in the first round of the opener. Rincon, 27, dropped Valadez less than a minute into the fight. The bout was halted soon after.